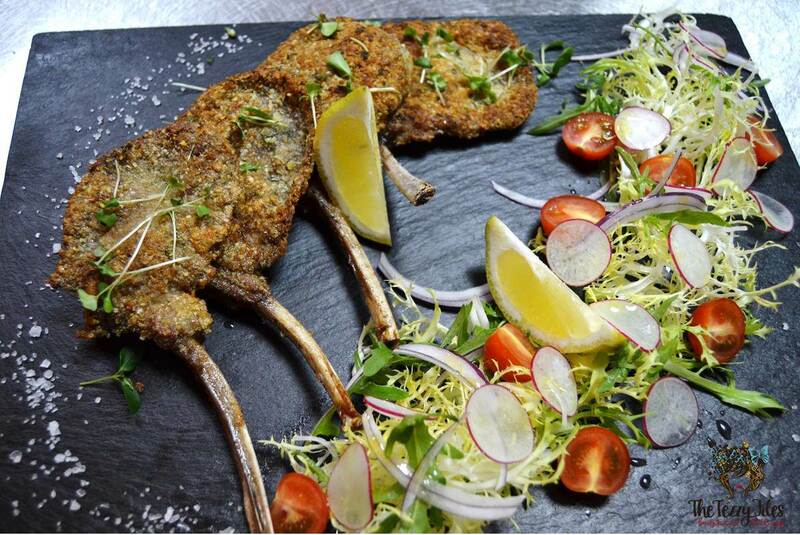 This is Chef Glady’s take on Costa di mandorle costolette di agnello (or Almond Crusted Lamb Chops for those not blessed with an Italian tongue!). It is a surprisingly easy recipe given how good it looks and tastes. If you are just starting your journey into Italian cooking, this dish is guaranteed to get you praises in no time. Read on for the recipe. In a bowl, whisk together the eggs, cheese and parsley. Season generously with salt and pepper. Pour into a large, shallow bowl or tray. In a separate shallow bowl or tray, spread out the flour. In a third shallow bowl or tray, spread out the breadcrumbs. Working one lamb chop at a time, coat each lamb chop in flour on both sides, and shake off access. The chops should now have a fine dust of flour all over. 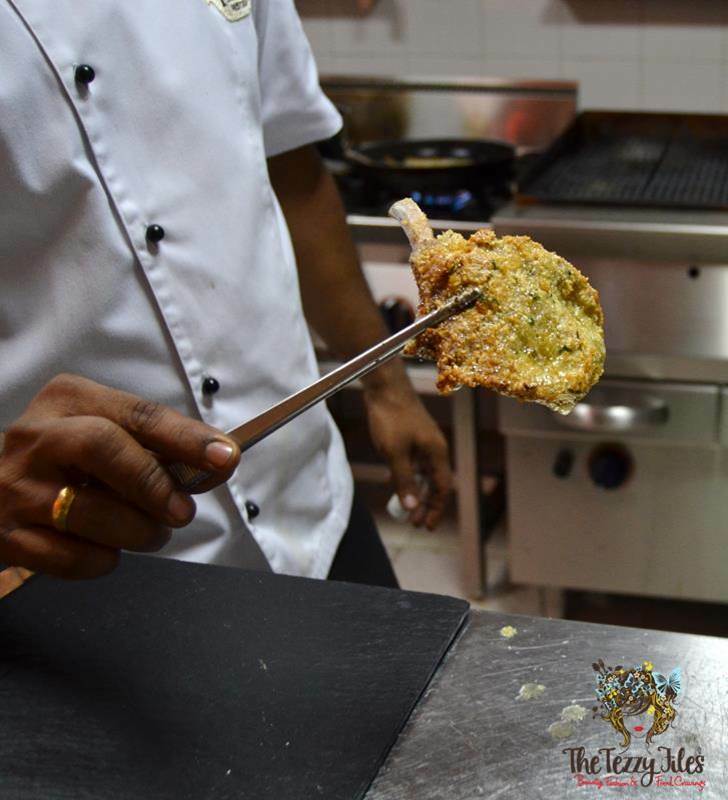 Dip the floured chops into the whisked eggs mixture, coating both sides and letting access drip off. Lay the chops onto the breadcrumbs, tapping ever so gently to ensure it now gets a thin, even breadcrumb layer on both sides. Place a saute pan large enough to fit 4 chops over medium-high heat. Pour enough oil and a generous spoonful or two of butter to cover the surface of the pan. When the oil simmers (it should be medium-hot), add the chops and cook until brown (approximately 3 to 4 minutes on either side). The chops should be beautifully golden brown. In a large mixing bowl, combine cherry tomatoes, radish slices and onion. Drizzle with olive oil and a few squeezes of lemon juice. Repeat the seasoning process for the lettuce leaves separately. Arrange the lettuce onto the wooden platter. 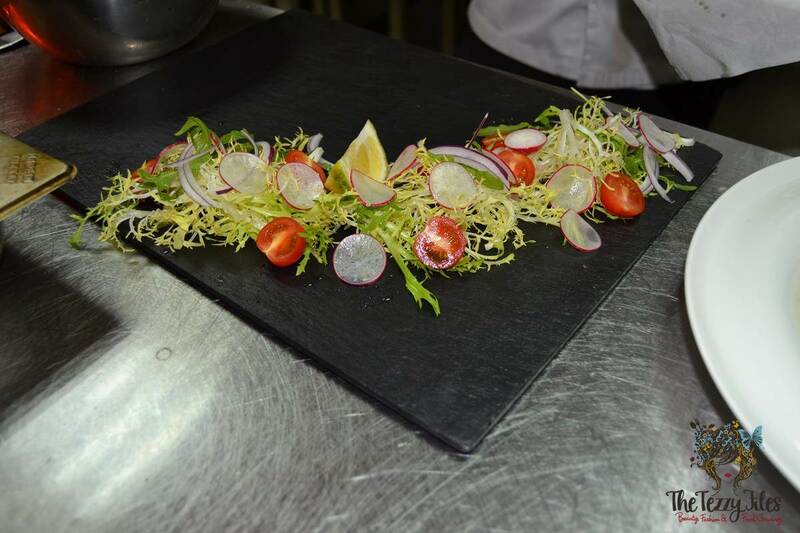 Carefully arrange the remaining salad components onto the lettuce to create a visually stunning display. 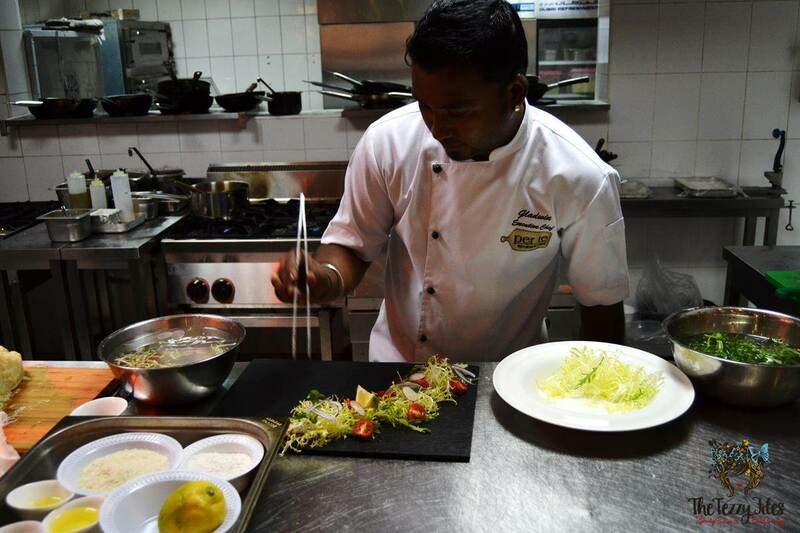 Chef Glady puts the final touches to his salad. 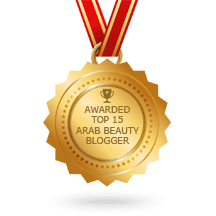 How colorfully stunning is this?! For final presentation, add the lamb chops to the platter. Garnish with a few wedges of lemon. Sprinkle generous pinches of sea salt around the parameter. 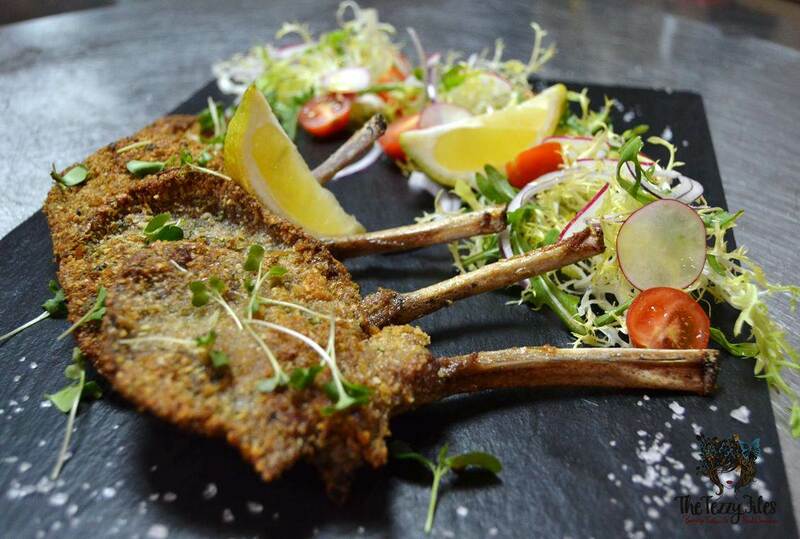 Try out more of Chef Glady’s mouth-watering creations at Per Te! Per Te is a fine-dining Italian restaurant, and is located in Jumeirah 1 right behind Jumeirah Plaza (Street 12C, Villa 54). Call 04 344 6455 for reservations. Posted in Meet the Chef, Recipes and tagged chef, chef recipe, dubai, Italian, italian recipe, lamb, lamb chops, recipe, recipes. Bookmark the permalink. Thanks Annie! It sure was delicious 🙂 Wishing you a great week ahead as well! Back to School with Lush!